InvoiceOcean allows you to perform an invoice with a discount. 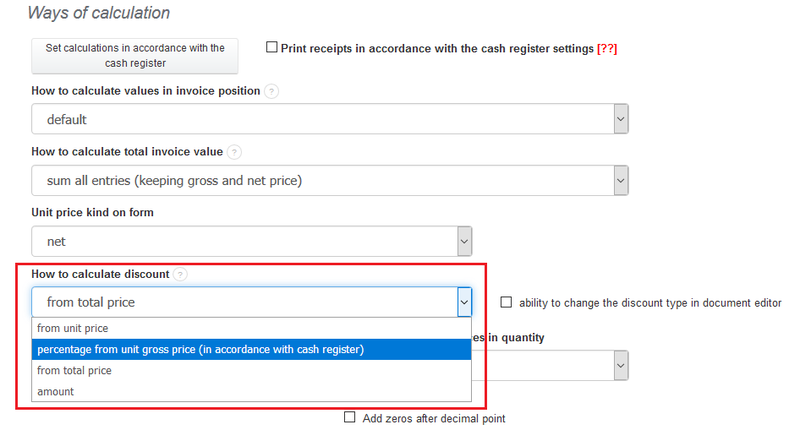 To choose one discount to all of the future invoices on the account go to Settings > Account settings > Configuration > Invoices and documents > Ways of calculation > How to calculate discount > Save. InvoiceOcean gives you also the possibility to edit just one, selected invoice and change the discount calculation on it. To do so, go to Income > Invoice > click on the crown-wheel icon > Edit > How to calculate discount > Save.